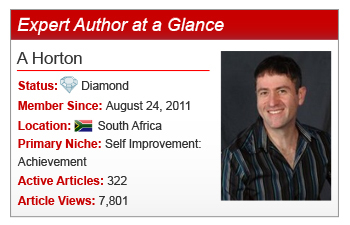 As one of South Africa’s top inspirational and motivational speakers, Expert Author A (Andrew) Horton ignites a spark that helps his audience achieve what they most desire. After kick-starting his social media presence in November 2009, Andrew began testing a variety of new strategies to attract new business and build his credibility. Enrolling in a 12-month online writing course in September 2010 to strengthen his writing skills, Andrew began to write personal development articles that targeted employees of corporations of more than 150 members who desired information and leadership on behavioural enhancement and performance maximisation. More highlights from our interview with Andrew below. What’s your typical writing session and environment like? [A] I wake up every day at 03H30 in the morning. This quiet and uninterrupted time, between 03H30 and 06H30, allows my mind time to wander into many different and interesting places. Places which encourages the flow of useful personal development articles. What’s your favorite EzineArticles tool? [A] Article tracking, reports on how my articles are performing, which titles work best, etc. What advice would you give to new Expert Authors? [A] Be authentic and write from your heart. Do not try to copy anyone else’s writing style. Find a cause bigger than yourself, which will inspire you to write on those days when you really don’t feel like it. Have an open abundant mind and share your expertise freely. The more people you can help to get what they want, the more likely it will be that you will get what you really want. Take a note from Andrew: Be determined, be passionate, and strive to be more. Set an expectation or goal for yourself by helping others achieve their needs and desires to realize your own. Do you have a question or comment for Andrew? Feel free to leave it in the comments section below. On My.EzineArticles.com? Click here to add Andrew to your Network! Awesome Author Showcase. Congrats A Horton for the publicity, and for striving to be the best that you can be in the self improvement niche. Thanks so much for featuring me in this showcase. I hope that the info I have provided was of service to the other authors. I must congratulate EzineArticles for providing such a wonderful platform for us to use, to spread our message to so many people. It is a real honor to be part of this community. May you all have a wonderful and very blessed year filled with love and grace. When this post came through my email, I thought I recognised you from my Fb friends. Your determination to improve your writing skills and enhance your Speaking through EzineArticles is a great encouragement. Thanks for sticking with it and having a story to share! You are an example of someone who chooses to succeed. You weren’t secure in your writing abililty so you took a year long training to hone your skills. You use the writing skills to build your expert status which helps to get speaking engagements and you use your speaking to inspire more articles. You also have created a really productive daily schedule that works for you. Amazing job. It’s great that you took the time to really learn your writing skills. Very happy for you! Thanks so much Lisa, I am really inspired to keep writing and contributing my message to inspire people to uplift their lives. Positive feedback like yours is really appreciated. Thanks so much Dr. Erica. I really appreciate the great feedback. Your kind words are most certainly an inspiration to me. May you have a wonderful and amazing year ahead. Thanks so much D.Dixon. Your I really appreciate you taking the time to offer your valuable input. May you have a wonderful and prosperous year ahead. Love your post,I hope you never stop, thanks for sharing! Thanks so much For the feedback Shimaa. I am really glad that I can be of service. May you have a wonderful and amazing writing year ahead. Thanks so much for the feedback Alex. I absolutely love my writing every day and it is a part of who I am. If I don’t write every morning I fell like there is something missing from my day. May you have a wonderful and awesome year filled with amazing articles.